After World War I many American artists rejected the trans-Atlantic influences of European Modernism. The onset of the Great Depression and the political posture of isolationism of the time led to the development of American Regionalism. This movement became one of the dominant art movements of the 1930's across the U.S. The artists’ depictions of daily life as subject matter represented a reassuring view of American life that people could easily identify with. The Regionalists searched to convey a sense of nationalism combined with Romanticism by depicting the spirit of a place. Artists painted the local communities they knew and understood. During the height of its expression between 1930 and 1935, the movement produced artists such as Grant Wood working in Iowa, John Steuart Curry from Kansas, and Thomas Hart Benton in Missouri. 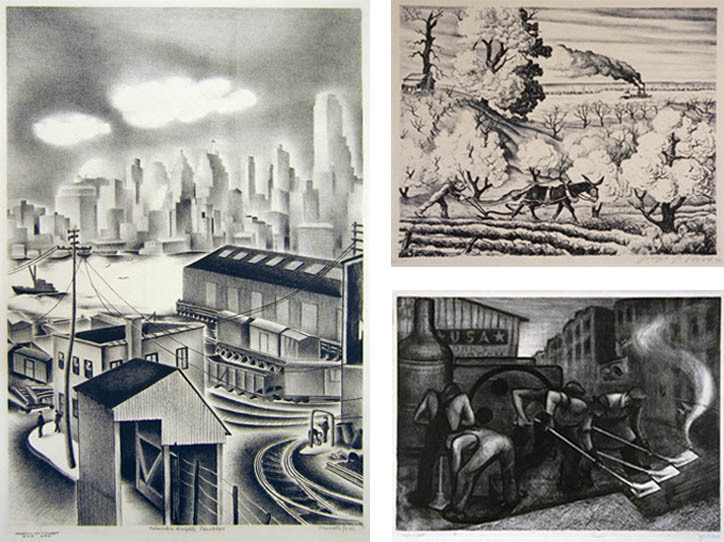 Painting from recognizable observations, these artists portrayed the landscape, in all regions, filled with characters of Americana, such as revivalists, bootleggers, and farmers – all depicting the rural values of hard work, self preservation, and the beauty of small town life or a nostalgic look at a city’s past. Click here for the American Regionalism curricular guide.